DUBLIN CITY COUNCIL is planning to install 3,000 new signs around the city, warning and educating people about dog fouling. Something on the footpath catches your eye, and as your mouth forms an “OH” of horror, you realise too late what lays before you. As your foot hits the ground, there’s that sickening ‘give’ that informs you you have made contact with a turd. You know what’s happened. You just don’t want to believe it. If you’re with a companion, you will almost certainly emit a low groan of “I just stood in dog sh**e”. Clutching at your friend/the wall/a lamppost for support, you commence the investigation of the sole of your shoe. It’s in all the ridges. Every last one of them. You want to find whoever owns this dog and you want to hide this dog muck in their pelmets and under their floorboards. You know even before you start that it’s going to be futile, but you do it anyway. You have to do something. You need to get to a place of refuge, where you can clean up the mess. So you hobble pathetically on your way, with just a heel touching the footpath, teeth gritted. Nothing short of a brush and some heavy duty cleaning fluid is going to sort out this situation. And gloves, lest some of it might get on your fingers. You can try to forget the stench, you can imagine that you’re clean, but the smell will linger in your nostrils for hours… maybe days to come. Email “The 9 stages of rage of stepping in dog sh**e ”. 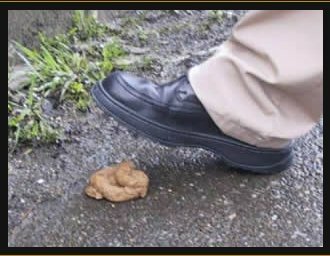 Feedback on “The 9 stages of rage of stepping in dog sh**e ”.